The German Power Metal band SINBREED started in 2000 as NEOSHINE, but due to a legal conflict with an American firm a new name needed to be chosen, hence SINBREED. This happened in 2008. In 2010 Ulterium Records released the band’s debut album, “When Worlds Collide”. Fronted by SEVENTH AVENUE (split-up since september 2012) vocalist Herbie Langhans, the band positively surprised the world with their first album. Catchy, vicious and powerful Metal from start to finish. Of course with enough melody make the whole more complete. Two years later BLIND GUARDIAN guitarist Marcus Siepen joined the fold. This was a logical step, as he also helped the band live in 2011. With fresh blood in the line-up SINBREED started working on album no. 2, “Shadows”. This time, however, it was AFM Records who saw hail in the band, and so they offered them a contract. “Shadows” came out on the 28th of March 2014. The new album contains ten songs and was again responsible for the mixing and mastering. Like on the debut album, a few guests were asked to contribute. This time they were: Andreas Gutjahr (TANKARD) for leads in “Standing Tall”, Stefan Schmidt (VAN CANTO, HEAVATAR) for extra choirs, and Kai Mühlenbruch (ex-GALLOGLASS, ex-SEVENTH AVENUE, …) for leads in “Broken Wings”. 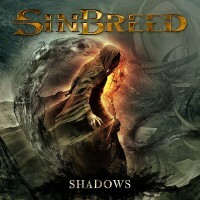 “Shadows” begins with furious pounding on the drums in “Bleed”, followed by the expected riffing. Together they advance, seeking the open road that allows them to roam free and fast. The train rolls onwards at very high speed! Add soaring vocals (rough edged, yet melodic), and the sonic picture is complete. The tempo remains high all the way. The chorus contrast a little with the verses thanks to the melodic input. Before the solo moments SINBREED takes a straight-forward road, a little different then the main parts of the song. Afterwards it’s indeed back to bridge and chorus and the end. Qualitative Power Metal, like before. The drums also play a key role in the next song, “Shadows”. Frederik rolls over his kit from left to right, again giving the sign to start building. Energetic pounding with chugging riffs then are let out of the boxes, like with dog racing. Same recipe as before, also with Herbie giving his all on vocals. The bridge is where melody pops its head out, ready for the straight-forward, galopping chorus. The layered vocals make this part sound grander, and it’s well done, I must say. The solo breaks the song in two, after which it’s back to business. This leads then to the magnificent “Call To Arms” with its melodic intro that pounds along until all chains are thrown off. Fast Power Metal is again the main course. A powerful, anthemic bridge, albeit short, connect with a hymnic, straight-forward and melodic chorus. Like before, the solo is the revolving door in the song. “Reborn” also has a hymnic touch, here in the intro. And again, as if Flo and co. applied the same procedure for this album, fast, speeding melodic Power Metal is set free. Full power (musical and vocal) is activated in the chorus. The solo moment was extended into two different ones. Another one of my favourites on “Shadows” is “Leaving The Road”. First a bit of building and then GO! Power, catchy, thundering Power Metal, though with a cleaner way of singing. Stretched-out vocals in the bridge, linking with the straight-forward melodic chorus where the singing was again layered. I did have the impression that the solo was this time better, more inline with the music. But like the previous ones, a strong track. “Far Too Long” continues like the majority of the songs, but you’ll notice it when you listen to it: furious, devastating Metal! High speed pounding with, I must add, the two guitars working well together. To enchance the vocal power, they were again layered in the bridge and melodic chorus. This is one hell of a roller-coaster of a song. A third favourite is “Black Death”. Yes, another speedy pounder, though with a midtempo bridge, and more vicious, ferocious guitar work in the chorus. It’s a darker song, and I can appreciate the change in style. Otherwise it would be a bit monotonous, no? Starting with a melodic intro, building the power along the way, the train then rolls onwards on the rail of “Standing Tall”. Fast, pounding drums, chugging riffs… a classic recipe for SINBREED. The melodic bridge this time creates tension for the full force that is unleashed in the chorus, which has übercatchy vocal lines! “London Moon” kicks off with a direct, firm tempo and melodic Metal. Not that different from the rest, though there is a contrast between the firm verses and melodic chorus. Last but not least, “Broken Wings”, which, surprisingly enough, does NOT begin like the previous songs. It has an acoustic intro, a very refreshing change. Of course, the fury and power of Metal must come out at some point. But the tempo isn’t that high, certainly not as high as before. The melodic, flowing chorus has an organ in the back and cleaner, more hymnic singing. This may not be so special, but this is a rather epic, bombastic song. It could have been a BLIND GUARDIAN or SAVAGE CIRCUS song. The song ends like it started, though now with a bit of choir vocals to create a certain atmosphere. Long story short: “When Worlds Collide” was a very good and entertaining album. And somehow it was to be expected that SINBREED wouldn’t change track after that one, but carry on where it left off. Having BLIND GUARDIAN guitarist Marcus Siepen on board has and will of course have its impact (on future releases). However, the production on this new release does sound a bit more plastic to me, less authentic. “Shadows” is a darker album than its predecessor, more ferocious. From start to finish you get sharp, powerful guitar work, soaring vocals, and thundering, pounding drums. As there are nothing but killer songs on this album, I can only heavily recommend it!